Like most college students, I had several different roommates over the years. All had fun, unique qualities, and we all got along so well. There are many fun memories we created over the years and the one I share today took place during my Freshman year. It was a Sunday afternoon. We were all in the kitchen looking for a little pick-me-up when Daniella pulled out her blender. She dumped in a can of beans, plopped a few scoops of tan gloopy stuff inside, tossed in some garlic cloves, and sprinkled in a few pinches of green powder. Then she pushed "blend." After a minute or so, she took the lid off the blender and stuck a pita chip right into the light creamy stuff. My curiosity was peaked. The only ingredient I recognized was garlic. What was that light creamy puree she had made? I asked her just that and Daniella said it was called hummus. She offered me a taste and I immediately had to know more about it. She explained that it was a simple chickpea puree eaten frequently in the Middle East. She told me all about chickpeas, tahini, and her special green spice blend, called Zatar, which came straight from the Middle East. Boy, was that stuff yummy. 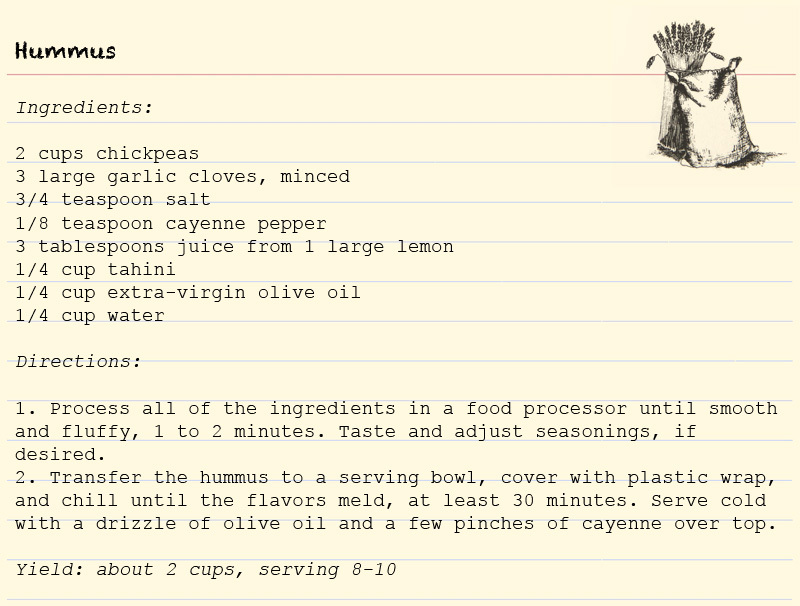 Not long after, I started making my own hummus and have been doing so since that first year of college with Daniella. Though I have no Zatar picked up from a recent trip to the Middle East, I still think this hummus is quite delightful. There are many different versions of hummus: black bean hummus, roasted red pepper hummus, sun-dried tomato hummus, chipotle cilantro hummus, the list goes on. Basically, if you can blend it, you can probably make some kind of hummus with it. 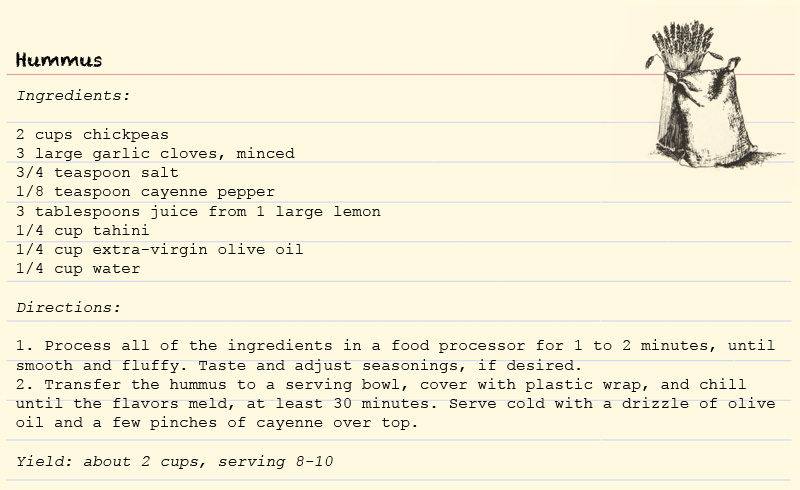 This is my favorite classic version: chickpeas, garlic, hummus, tahini, lemon, olive oil, and a few spices. Hummus makes for a great afternoon snack. It's healthy, filling, creamy, and light. I like hummus served with pita chips or homemade crackers. It is also a great spread in sandwiches or a dip for vegetables. 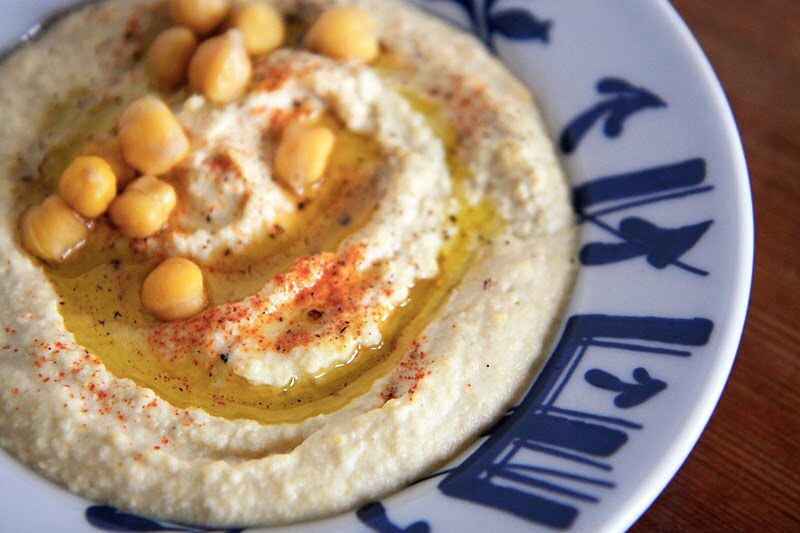 Notes: The only special ingredient you need to make hummus is called tahini. Tahini is sesame paste - simply ground up sesame seeds. Think of peanut butter, but made with sesame seeds. You can usually find tahini by the peanut butter in most grocery stores. Also, I like the fresh taste of home cooked beans, but you can certainly use canned if you prefer, just be sure to drain and rinse the beans. I love the original too, though I do occasionally like putting spinach in mind. Have you ever tried garnishing it with a bit of Aleppo pepper? It is a middle eastern spice and it is so good! Lindsey and I have everything on hand except the tahini, but we are going to make it today without it. Thanks for the recipe idea! Great photo. Kelly - I'll be interested to know how you like this without the tahini. I think it's a pretty key ingredient here - it adds a really nice flavor. But I know that some recipes for hummus don't call for it, so it might be fine.